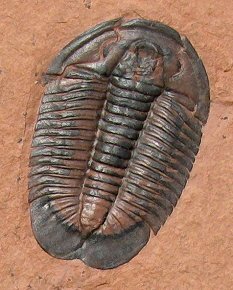 This is a fabulous US trilobite. It is an extremely rare Coosella sp. from the Upper Cambrian of Utah. This specimen is not only complete, it is stunning. The free cheeks are intact, and the body segments and fan-like tail are wonderfully articulated. The thick shell exoskeleton is finely detailed and exquisitely preserved - the outline of the hypostoma (mouthplate) is even preserved and easily seen. The rich, black bug contrasts beautifully with the natural red matrix. This is an extremely collectible example of this very sought-after trilobite from Utah.